Don’t buy a natural Christmas decoration like this one, make it! Festive hangers like this are in fashion at the moment: they are very simple to make, and much cheaper to make yourself than to buy in the shops. This is a picture of one I bought to sell in my shop a few years ago with an RRP of £4. 1. Carefully poke a hole through the centre of all the orange slices and bay leaves. 2. Tie the raffia firmly around one of the cinnamon sticks, so that both the ends of the raffia are the same length. 3. Thread both ends of the raffia through 3 bay leaves, then all the orange slices, then the rest of the bay leaves. 4. Tie the second cinnamon stick in place on top of the stack, and form a hanging loop. - Try something similar with dried chillies, whole dried oranges or rose hips, and I’ve also seen other fruit such as mini pumpkins, dried apples and limes being used. 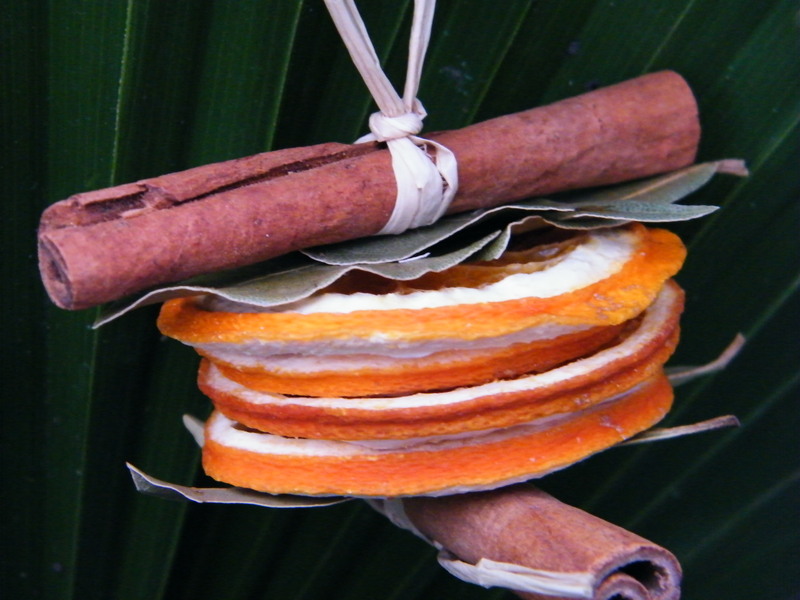 - If you would like to enhance the fragrance of the cinnamon sticks before use, you might find this recent blog post useful: How to make cinnamon fragranced bundles. – Try drying your own orange slices by putting on a baking tray in a fan oven (30degC or lowest setting) for a few hours.